Its been a reasonably mild winter here in London this year even though we had a brief spell of unusually cold weather right before Christmas. Thankfully, I missed the worst of it as I headed back East for a 2 week break in the tropics. Still, since I'm accustomed to heat and humidity, the mild winters here can still feel bitingly cold to me. As such, there's nothing I like better than to warm up with a hearty bowl of steaming, hot soup. If you've been following my blog, you'll know that late last year I discovered the wonders of using pumpkin in baked goods. 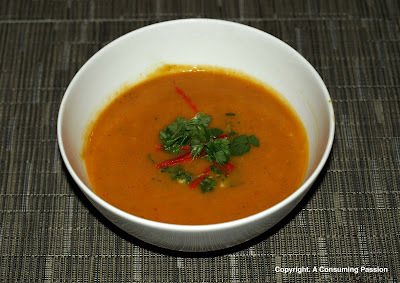 This year, I'm continuing to find that pumpkin is amazingly versatile as demonstrated by this Thai-inspired pumpkin soup that I made for dinner last night. For dinner, I served it with some crusty pieces of toast as an appetizer but I find that by tossing a few pieces of chicken in, it can even be a meal in itself, as it was for my lunch today! To make the coriander pesto, whiz the coriander, lemon zest, lemon juice and garlic in a food processor. Slowly add 60 ml of the oil to make a sauce consistency, adding a little warm water if necessary, then season to taste. Heat the remaining oil in a large pan over a medium heat. Add the onion and stir for 1 minute. Add the ginger and curry paste and stir for 1 minute. Add the pumpkin and stock, bring to the boil, then simmer over a low heat for 15 minutes until pumpkin is cooked. Cool slightly, then blend until smooth. Return to the pan, add the coconut milk and season, then warm through. To serve, pour the soup into bowls and swirl in a spoonful of pesto. Garnish with the onion, chilli and reserved coriander leaves. Pumpkin is wonderful, especially in soups - I like the thai sound of this one. Very pleased that the winter here hasn't taken as cold a turn as it seemed to be taking just before Christmas!